Last week I had some public experience with conscious incompetence. It was a little unsettling. Before we begin learning a new skill, we are unconsciously incompetent. In other words, we don’t know what we don’t know. There are lots of things that we are unconsciously incompetent about. For example, I know little about bridge building, and until I cast about trying to come up with an example, I hadn’t thought about how to build a bridge or my lack of knowledge around the topic. Once we are aware that we don’t know something and decide that we want to begin learning about it, we are in the consciously incompetent stage. We make a lot of mistakes in this stage and begin to build a body of knowledge. For bridge building, I could begin with popsicle sticks and move to using 2x4s to create a bridge. I might decide to go to school or become an apprentice. During conscious incompetence, we have a pretty good idea of what we don’t know, and we work to acquire the skills and knowledge that we need. Once we have some experience under our belts, we become consciously competent. We know our stuff, but we still have to pay attention to what we are doing. It doesn’t come naturally. 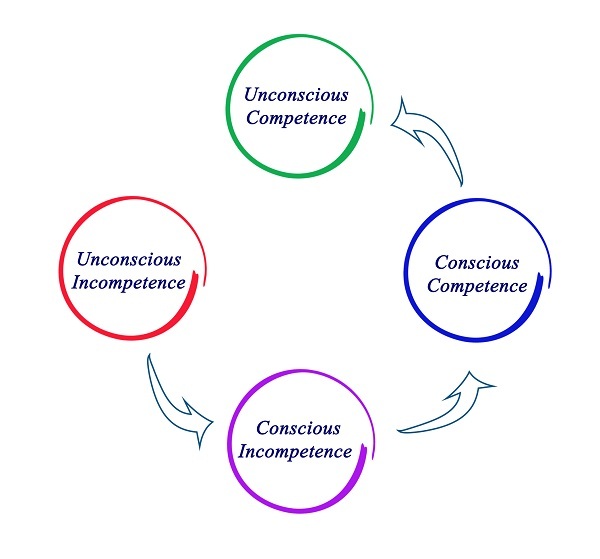 Finally, we get to unconscious competence. We are so good at what we are doing, we don’t have to think about it anymore. I think it’s Malcolm Gladwell’s 10,000-hour level that he describes in Outliers. We are experts in our field of study. When I’m talking about leadership, I am unconsciously competent. I’ve put in my 10,000 hours of study, coaching, and training. That’s not to say that I don’t keep learning and growing, but I am comfortable in the world of leadership. People ask me questions and respect my opinion. It’s nice. I like it. I work to stay at this level by continuing to practice my craft and research my area. However, last week I jumped into the world of interior decorating. Let me just say upfront that this is not an area of strength for me. I’m not good at interior decorating. I still live, for the most part, in early 20s décor. If it’s useful and I like it, it stays. I like a put-together house, but I don’t want to figure out how to do it. It just doesn’t light my fire. At the Dallas Market last week, she managed a booth for a company that makes bedding and pajamas. They make beautiful down pillows and comforters. Our booth looked like a comfy place to take a nap – and that’s about all I knew about the products. The interior decorators and shop owners expected me to know more than the fact that it was soft and comfy. They wanted to know the prices, differences in the various comforters and pillows, and what everything was made of. Don’t get me started on the sheets, duvet covers, and shams! They used words that I had never heard before, like matelassé. You get bonus points if you know how to pronounce it. I also realized that I didn’t know the significance or meaning of words I had heard before like percale, sateen, and jacquard. I was totally out of my depth! I like being an expert in my field, and being incompetent at something was a startling refresher on what it’s like to begin at something. The people who came to the booth rightly assumed that I knew the products and the terminology. They were disappointed and disapproving when they got my deer-in-the-headlights look in response to their questions. I found myself wanting to explain that I was helping my aunt by keeping her company and acting as a guard when she went to the bathroom. Fortunately, I’m familiar with what good customer service looks like. I smiled, listened intently and said “Let me get that information for you” a lot. I knew that they weren’t interested in excuses or explanations. I also paid attention to what my aunt said and learned some things. I learned which comforters had Scandinavian down and which had Hungarian. I memorized the prices of the PJs and what they were made of. I didn’t learn enough to move out of conscious incompetence, but I did get less incompetent! Hopefully, I didn’t cost her any sales. I also had a lot of fun. I like learning about new worlds and perspectives. As a result of several conversations, I changed the name of the mobile home that I am staying in from “the double wide” to “the casita.” Well-to-do people who shop the Dallas Market call the small houses on their properties casitas. I like it. The thing that struck me the most about my time at the Dallas Market was how bad I felt when I didn’t know an answer to a question. I took the disapproving looks to heart. It was a great reminder of what it feels like to start something fresh. It was a little exciting and a little frustrating. As a leader, I want to remember to be kind to myself and others when we are in the conscious incompetence stage. We can’t learn and grow unless we step out of our comfort zone and admit we don’t know everything. We can’t expect our employees to learn and grow unless we support them during the vulnerable stage of conscious incompetence. Every expert starts as a consciously incompetent beginner.